Arden Scott is a sculptor who lives and works in Greenport, Long Island, next to Brewer's Boat Yard where she keeps the Annie – a 28 foot sailboat she built. 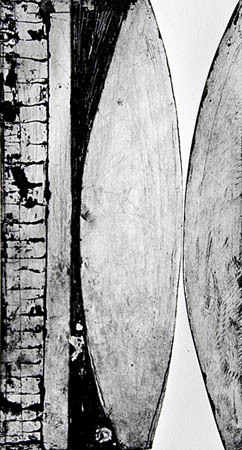 As a guest artist at Bob Blackburn's printmaking workshop, she was seduced by etching as a creative form complimenting her sculpture. She shows extensively in the US and abroad and has received numerous grants and awards, including a Guggenheim Fellowship,a NY Foundation of the Arts grant, and a Pollock - Krasner Foundation Fellowship. Her work has been exhibited at Pratt Institute, Brooklyn, Dowling College in Oakdale, New York, the Parrish Art Museum in Southampton Long Island and The Kathryn Markel Gallery in New York City and Bridgehampton, NY. In 2002 she was featured in the New York Times article entitled "Far from Midtown, She's Fallen in Love with the Sea" by Amei Wallach.